Popular and increasingly in demand, 'Izipho Zam' (My Gifts) falls into the rare category among record collectors and is a gift to fans of master Pharoah Sanders. This demand is partially galvanized by the fact that Prince Of Peace has become an inspirational mine to hip hop artists and is much loved by samplers. 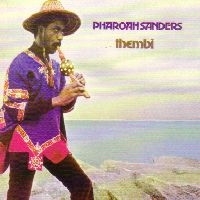 'Izipho Zam', Pharoah Sanders' third album, initially recorded in january 1969, was originally released on the Strata-East label in 1973. On 'Izipho Zam' Sanders and his band take you on a journey into another world providing an amazing experience! Passionate, intense and free, Sanders' saxophone especially, is exquisite, pouring out its soul telling a story of its own. 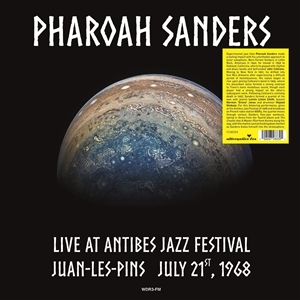 Pharoah Sanders: Live at the Antibes Jazz Festival in Juan-les-Pins July 21, 1968 Experimental jazz titan Pharoah Sanders made a lasting impact with his unorthodox approach to tenor saxophone. Born Farrell Sanders in Little Rock, Arkansas in 1940, he was given the nickname Pharoah by grandmother, in reference to the potential regal lineage of his African heritage. Playing clarinet at church services during his youth, he began playing tenor sax at high school. In 1959 he moved to Oakland, California, where he played with rhythm and blues bands and befriended John Coltrane. Moving to New York in 1961, he drifted into Sun Ras Arkestra after experiencing a difficult period of homelessness. His status began to rise upon joining Coltranes band in 1965, where his discordant solos formed a strong contrast to Tranes more melodious sound, though each player had a strong impact on the others subsequent work. Following Coltranes untimely death in 1967, Sanders formed a quartet of his own with former Jazz Messengers pianist Lonnie Liston Smith, bassist Norman Sirone Jones of the Untraditional Jazz Improvisational Team, and drummer Majeed Shabazz. 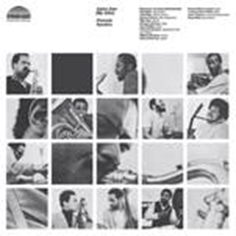 For this blistering performance, given at the Antibes Jazz Festival of 1968 and broadcast on French radio station WDR3, the quartet moves through various Sanders free-jazz workouts, taking in "Venus" from the Tauhid album and "The Creator Has A Master Plan" from Karma along the way, with the rhythm section holding down the fort as Sanders blows himself into the stratosphere. Simply a great album! Thembi (meaning 'Hope, faith & love') was recorded in 1971 and features artists such as himself, Lonnie Liston Smith, Michael White, Cecil McBee, Roy Haynes and more. Comes with the title track and cuts like 'Astral Traveling' etc.